To the scientist, the librarian, or the postman, a name is a means of identification. But a name can be more than simply a label — we might all be calling each other by numbers if that were true. Names are often a source of knowledge, of history, even of romance. 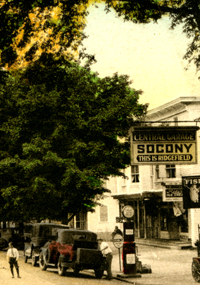 And it is to record not only the fact of, but also the history and, where possible, the significance of Ridgefield’s geographical names that this record has been compiled. --From the Introduction to Ridgefield Names. NOTE: This text, much of it scanned from manuscripts, contains many typographical errors. These errors are being corrected. In addition, this history is being updated and revised. New names and new information about old names are being added. I hope to be able to publish Ridgefield Names in book form, with many illustrations, when time and finances allow.